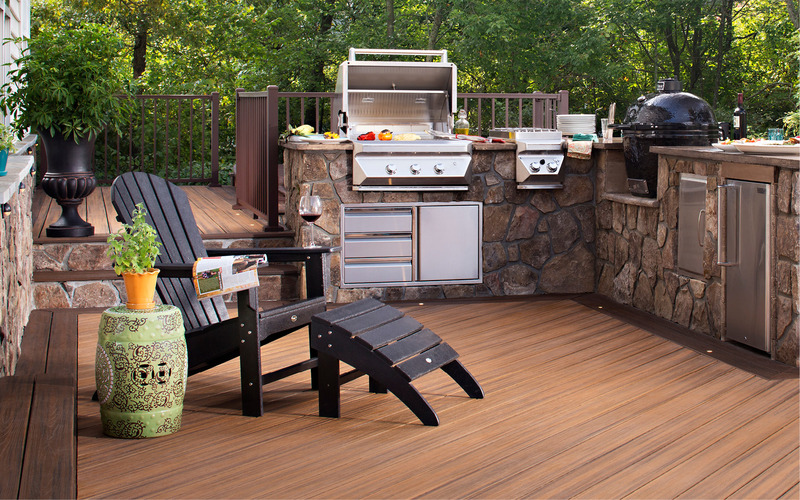 With the warm weather comes the opportunity to entertain outdoors this season and into fall. 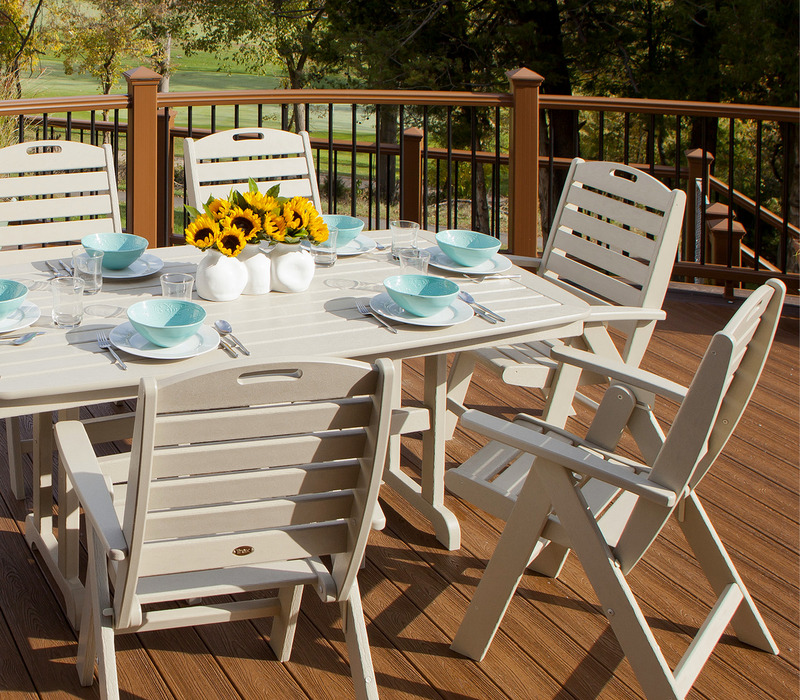 Before you dine al fresco though, make sure you understand how to get the most use out of that outdoor dining space so your guests have plenty of room to eat, drink, and enjoy each other’s company. 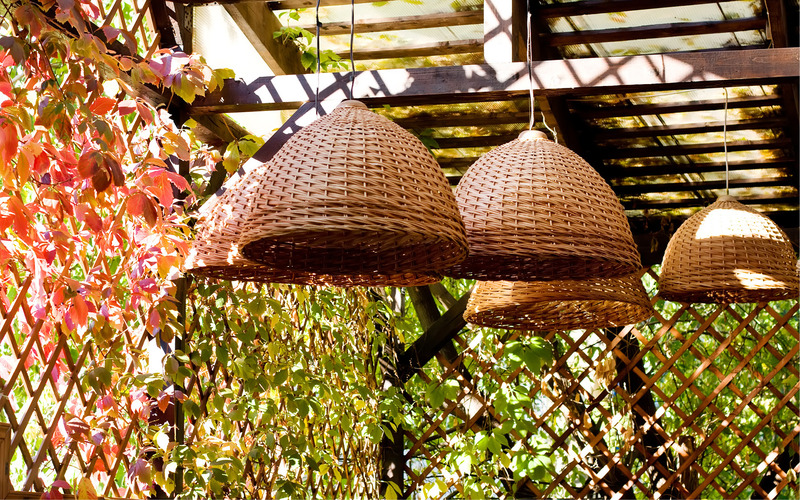 Here we break down a few tips to create a functional, beautiful outdoor dining space, so you can spend many an evening in your yard. Do you frequently gather with the 20 members of your book club for hors d’oeuvres and wine? 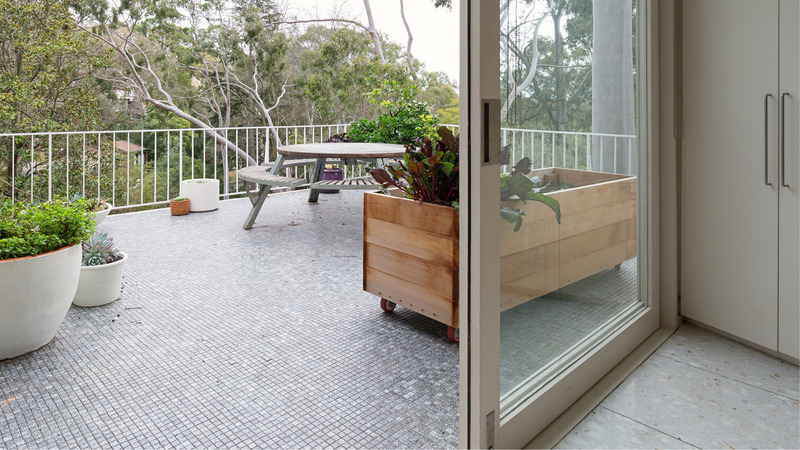 Is your backyard real estate limited to a small patio that only has room for two? Are you trying to serve outdoor dinners to your family of six? Or is it a little of all of the above? 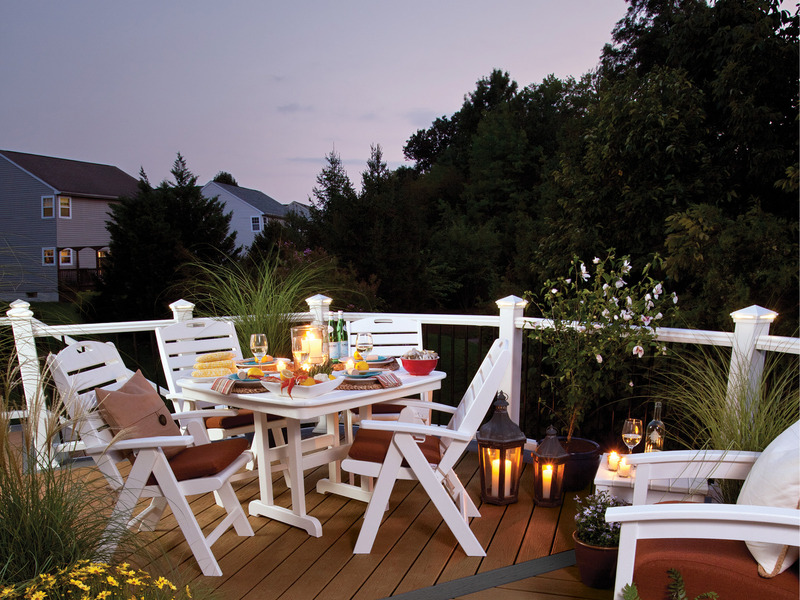 Decide the type of outdoor entertaining you’ll most likely be doing so you can plan your space from there. 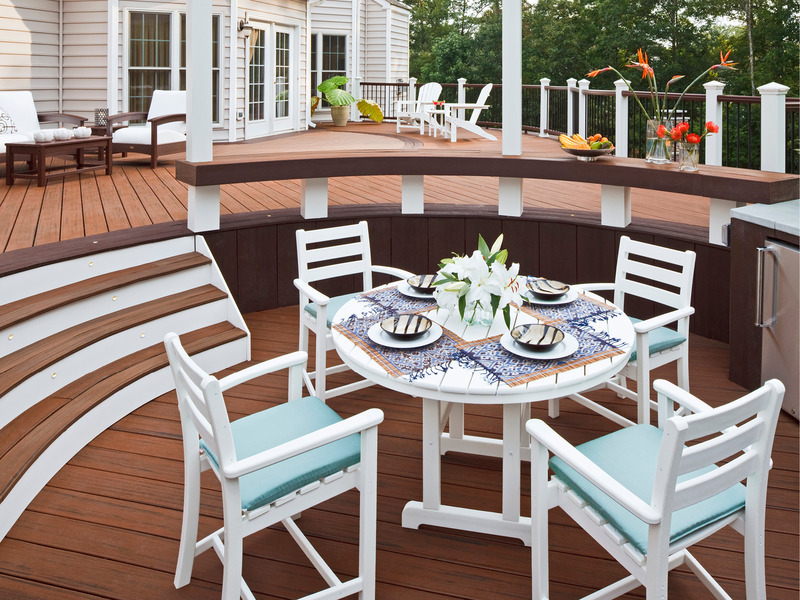 Whether you have a small deck hemmed in by railings or a vast open space that can accommodate a large crowd, measure the intended dining area so you have an idea of dimensions. 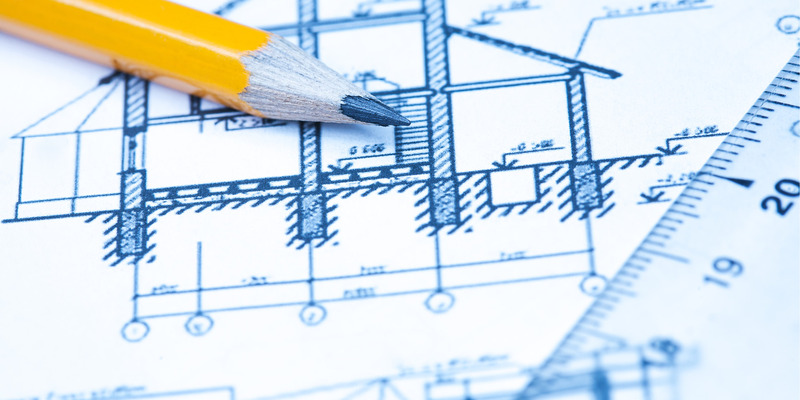 We recommend sketching out the general size and shape onto grid paper. Once you have your measurements, you can decide what furniture can reasonably fit into that space. Do you need a long table with plenty of chairs? A bar-height table and just two chairs? Are you keeping a grill or a bar cart in the space? Once you know what furniture you want, check the furniture and outdoor space dimensions to make sure everything comfortably fits. If possible, a good rule of thumb is to leave anywhere from 36 to 48 inches of space behind each dining chair and about 24 inches between each chair. If you’re unsure whether furniture will fit, sketch out the furniture dimensions onto that grid paper and play around with the setup. Here you’ll want to focus on the comfort of yourself and that of your dinner guests. A round table makes for a more intimate dining experience. Whereas, if you want something a little more informal that transitions from cocktail hour to dinner hour, you might want to create a lounge-like area with a settee and a pair of cocktail tables or a coffee table. For a small space, add a counter-height table and a pair of chairs. Family-style dinners lend themselves well to long, rectangular tables and benches, which seat more guests. If you have the space, consider a small table to use as a serving area or to mix drinks. If you have a large patio space, consider dividing it into zones—the grilling and bar area, a lounge area, where guests can prop their feet up and settle into a club chair, a dining area lined with benches along one side and chairs along the other. Just make sure to keep a grill far enough away from the furniture but close enough that you can regularly check on your steaks and veggies. We’re always of the mindset that adding color creates visual interest to a space. Whether it’s a nice colorful tablecloth or runner, planter boxes filled with bright flowers, an area rug beneath the table, or even colorful dishes, a cheery palette makes your furniture stand out and lends character to the space. Let your guests want to linger for hours, swirling that last bit of wine and savoring the morsels of dessert or just appreciating the conversation. Comfortable seating, throw pillows, and cushions all go a long way toward getting your guests to stay longer. Live in an apartment and have limited outdoor real estate? No problem. Enjoy tapas and cocktails from the bar table on your balcony. Add a small serving table or bar cart just inside the living room door so guests can easily reach what they need. Or set out a spread on your indoor dining room table, have guests serve themselves inside, and bring plates out. You don’t have to throw a romantic dinner party to add candles to your space. 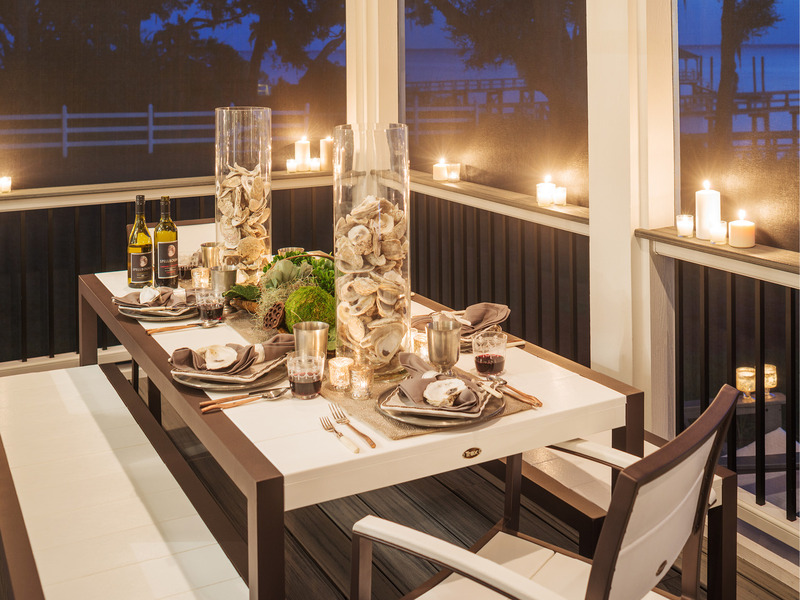 Line your table with lanterns, add outdoor lamps to the area, or string up lights. Let your guests bask in the glow of the lighting you set in your dining area. Enjoy your brunch or lunch out-of-doors when you cut the glare so your brunch group doesn’t have to squint over mimosas or coffee. Consider locating your dining space beneath sunshades, large patio umbrellas, a porch overhang, or a pergola. 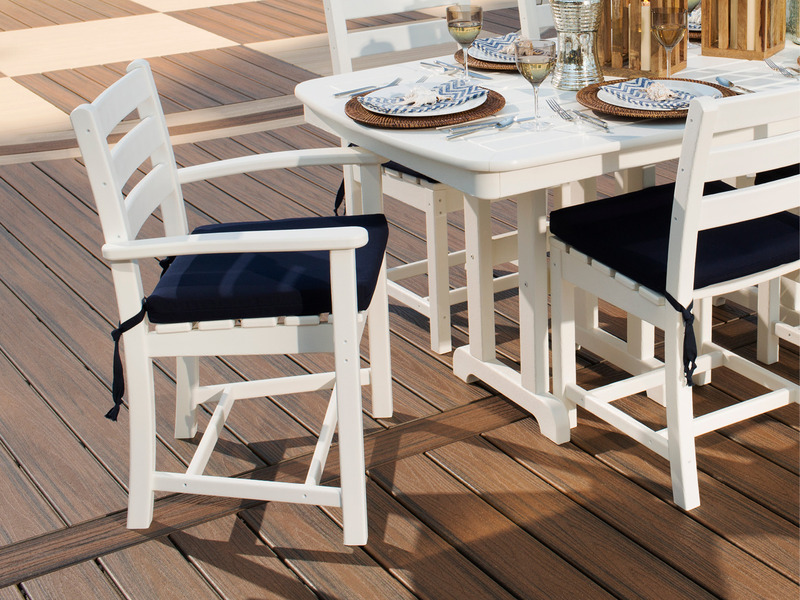 Last, creating an outdoor dining oasis shouldn’t be stressful. 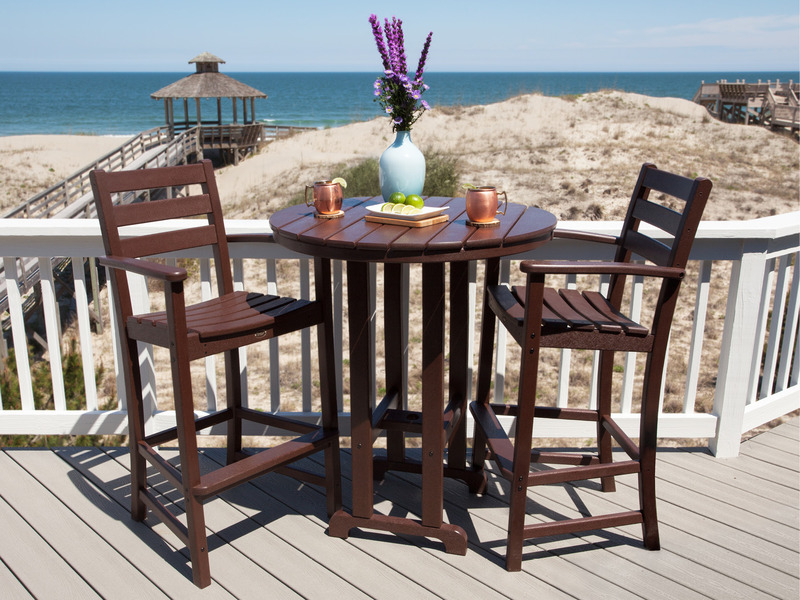 Plan out your space, your furniture … and enjoy your friends and family all summer long.